It's been said over and over. Where are the mecha clones? Personally, I enjoyed playing Battletech and Centurion quite a bit growing up. I think Scott and I ran so many Centurion games, I thought about custom hovertanks in my sleep. 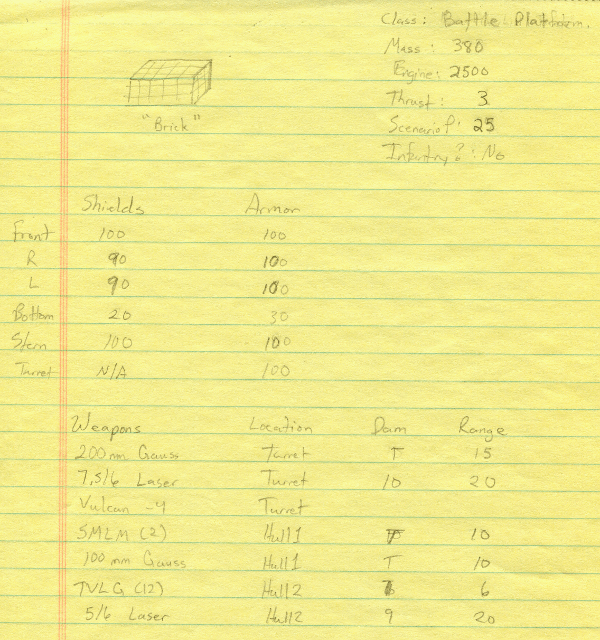 I also had a perchant for making a lot of units for Battletech. I was terrible at tracking heat, so I usually lost by blowing up my own mech. Maybe that's why I liked Centurion so much more. So when it comes to an OSR Mecha game, what do we need? After all, there is the Battleforce Quickstart Rules and the Classic BattleTech Quickstart rules, so why another game? With a worlds-spanning concept like Spelljammer, it was easy to add yet another Crystalline Sphere that existed way beyond any known path through the phlogiston. Very few things made it from those distant spheres, but the handful of items that do lead to some very interesting magic items. I don't mean artifact-type weapons, but other things more mundane. I'm talking things like UHF communicators, AIs, non-addicting stimulants, and even some cyberpunk elements like cranial dataport jacks. When you cross magic and technology, you get all kinds of weird things. Then again, sometimes I don't want a crazy fantasy world, I just want to run a lance from one side of the board to the other in a desperate blitz to get to base through enemy territory. No air support or planet destroying megaships involved, just tanks and mecha slugging it out on some far-flung scorched world. Again, with one of the Quickstart rules I mentioned earlier, I could do that fairly easily. I still have my Centurion Box and original BatteTech rules (complete with a few technical updates and Maximum Tech.) Yet, there are things that I either house-ruled or just plain hated about each set of rules. 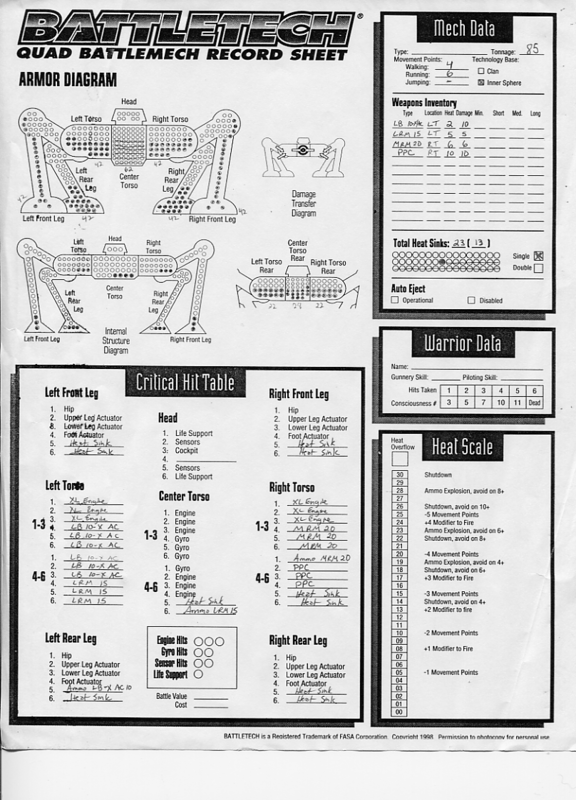 I could deal with the heat rules in BattleTech, even though I was terrible at them. The heat rules force you to make strategy and save your powerful punches for opportune times. What I couldn't deal with, was facing. We would agonize over the board trying to set the facing in just the right way to move and point our primary weapons systems in the correct direction. Centurion had no heat rules, but once I reached a certain speed, I couldn't steer a hovertank correctly. (I kept turning too late and sliding sideways off the map.) I preferred the slower groundling tanks or massive hover tanks that always moved slowly. Note that my "brick" has a speed of 3. These are not faults with the games themselves. No, the fault is mine. It's not that I just wanted to blast through everything or try to get away with things, it's just that I couldn't figure out where I'd be two moves ahead, so I got frustrated when I always felt out of place. I figured that any computer-assisted steering system could figure out how to move a tank/mech from one location to another accurately, so why not minimize those rules that blow me off the map? Really though, I just enjoy Swords and Wizardry. With the third alternate combat sequence, I saw a tactical system that rewards quickness over flat-footed slugfests. Why not make a mecha system without heat and hover movement that feels like S&W? The third alternate combat sequence is really simplified from OD&D. I looked for ways to track the segments and found stories of gamers using cribbage boards. Looking at the rules, though, I realized that I never really needed to know the actual segment number, I only had to know who's turn was next and when a round was over. I made a custom board that allowed the rules as written in S&W Complete for alternate combat sequence #3 to work. Still, I wanted something a bit nicer. I discovered that if I used a backgammon board and changed the default number of segments from 6 to 7, the whole system just clicked. In S&W fantasy, the referee had to fudge the dexterity of monsters. In my mecha game, however, everything had a dexterity score. This made the alternative combat sequence #3 a great fit. With the backgammon board, a players' choice of miniatures, markers, or even checkers to mark each combatant, a straightforward system emerged. Unlike my favorite Centurion or BattleTech, this game has quicker rules. At a glance, everyone knows who is taking a turn now and who will go next. I'm still testing it, but my 8 and 7 year old kids seem to get it. I've got it written, but now I'm testing it. I might even get a pickup game at Nuke-Con in October.